The Fondation IPSEN is delighted to invite you to a theatre performance about familial upheavals when a family member is affected by Alzheimer’s disease or cerebral dementia (November 21 st at 4pm). This play has been written by playwright Brian Daniels and directed by Jeni Draper, has had more than 200 performances and explores with insight and humour the impact of early onset dementia on family life. Our “Science for People” program is composed of accessible meetings and webinars to improve access to science. Brian Daniels’ play “Don’t leave me now” is about caregivers of people with Alzheimer’s Disease or cerebral dementia. Learn more: visit our website. 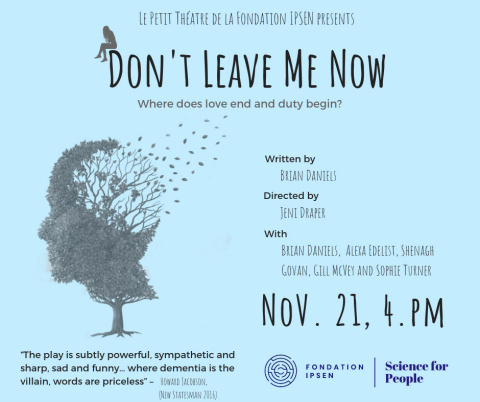 “Don’t Leave Me Now” written by playwright Brian Daniels and inspired by real stories, explores with insight and humour the impact of early onset dementia on family life. Where does love end and duty begin? or does it? “Don’t Leave Me Now” is endorsed by all major Dementia Charities including Dementia UK, The Alzheimer’s Society, Dementia Pathfinders, Cruse Bereavement Care, Hospice UK (formerly the National Council for Palliative Care). The play has been widely performed throughout the UK and Northern Ireland in theatres, hospitals, hospices, community centres, libraries, care homes, churches, mosques, synagogues, universities and schools. The play has been seen in the U.K. Parliament. Established in 1983 under the aegis of the Fondation de France, Fondation IPSEN seeks to holistically promote research in various therapeutic fields to improve human well-being and health. In this respect, the Foundation aims to facilitate the process of interdisciplinary groups of scientists and clinical practitioners from different countries, to promote the interactions needed between specialists in different fields of research, and to spread knowledge to people.